You might think that digital advertising and a social media presence are the marketing waves of the future, and while every small business should focus on its digital outreach efforts, you still need to establish your brand within the industry in a tangible way. That’s where trade shows come in. These might seem counterintuitive when you’re trying to attract more customers, but becoming a trusted name among your peers will only serve to heighten your reputation with consumers. 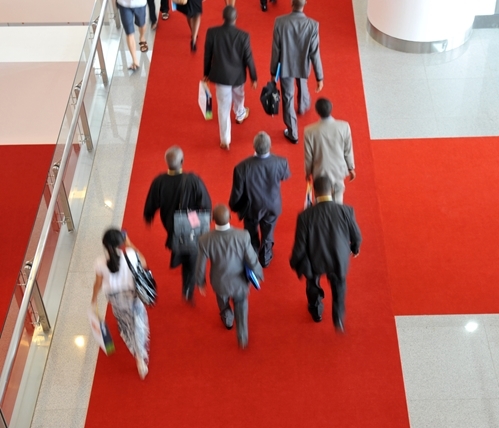 According to the Trade Show News Network, 81 percent of show attendees have buying authority over their companies. You never know who’s looking at your products or services, which is why every second counts when it comes to drawing customers in and keeping them there. One lost art of trade show success is the physical design of your booth display, but nailing that with a unique and engaging look can be a major tool in your arsenal for trade show success. Check out these three ways you can capture more eyes at your next event and come back to the store a leader in your field. Consumers are a lot more discerning when it comes to cutting through marketing white noise, which means you’ll have to go above and beyond with booth design to draw in attendees. Instead of a folding table covered with a tablecloth and pamphlets, Hubspot explained how nontraditional shapes can be the arresting look you need to stop consumers in their tracks. Whether you decide to create a towering structure or a mock-up of another location to promote your brand, Hubspot urged business owners to pay for grid space that’s more versatile and allows more configurations. A narrow strip only allows so many different looks, while a square or rectangular shape is much more flexible. Very few attendees have all day to spend meandering through the exhibition halls, so you need to make sure your booth is one of the first ones they visit when they arrive. You can do this by emphasizing your customized logo and name wherever possible, and no booth display is complete without Myron’s 60″ Full Color Promotional Banner. Position the banner in a high-visibility area, or angle it toward a section where you expect many attendees to congregate. If they won’t come to your booth, at the very least they’ll have seen the banner and acknowledged your brand to remember later. Consumers today are practically begging for brands that connect with them on a level beyond the traditional brand-to-consumer relationship. And while promotional giveaways are an essential part of success at any trade show, how you get them in the hands of attendees matters more than anything else. Forbes magazine explained that, since every single company at trade shows is going to be giving out their own mementos, setting up contests or drawings where attendees win prizes turns an otherwise brief moment into a chance for meaningful interaction. Even if attendees don’t do anything with the actual promotional products, they’ll remember the fact that they were engaged with your brand at a level beyond that capable from a personalized pen. It’s your job as a small business to keep your finger on the pulse of not only your community, but the industry your brand is operating in. There’s no better way to learn about competitors and partners than at a trade show, just like there’s no surer way to guarantee success than to double down on your promotional marketing product strategy.